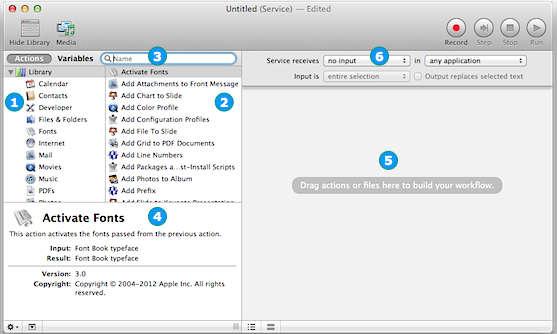 With Automator you can automate much of what you do with your computer. Create and print a family directory of family members in your Contacts. Find and add images from your favorite websites to iPhoto. Print your documents to your iPad. Instantly rename dozens of files in the Finder. Even perform scheduled backups of important information. There’s no limit to what you can do, and Automator can do in seconds and minutes what could take you hours to do by hand. Open Launchpad and type Automator in the search field. 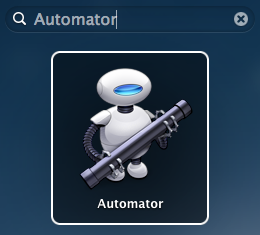 Click the icon of “Otto” the Automator robot. 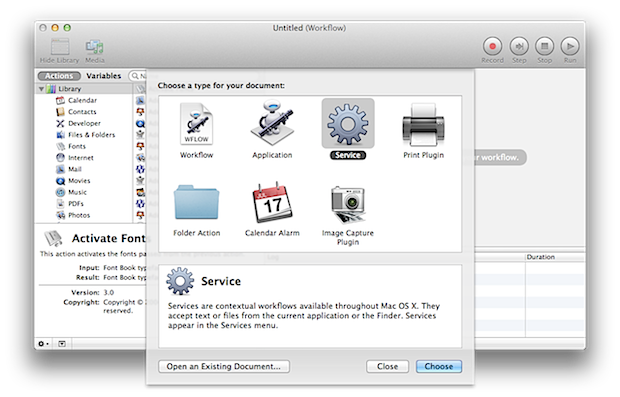 A new Automator workflow window will appear. (5) A workflow pane on the right side of the window, where you drag actions to build your “automation recipe"
Service workflows are often designed to work with files or text, selected in other applications, such as image files selected in the Finder. In this example workflow, the service will generate a new photo for you, so there’s no need to accept any other files as input for the workflow. Set the service workflow to ignore any existing selected items by choosing "no input" from the Service receives pop-up menu (6) at the top of the window (see the image above). Now that the input settings for the service workflow have been set, let’s construct the workflow by finding and adding actions from the Actions Library to the workflow area. 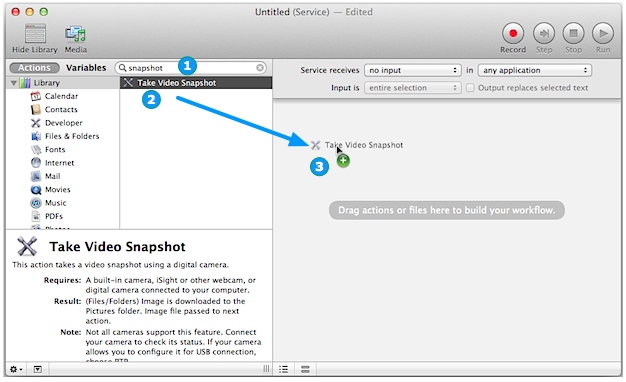 We’ll begin by locating an Automator action for taking a camera snapshot. In the search field (1) enter the term snapshot and any Automator actions related to that search term will appear in the Actions list below the search field (see below). According to its description at the bottom left of the workfow window (see above), the Take Video Snapshot action, is perfect for automating the quick snapshot of a photo using the computer’s built-in camera. Drag the action title from the Actions list (2) into the workflow area (3). When an action is added to the workflow area (see above), it displays a rectangular view containing controls for setting the values of any parameters it uses. 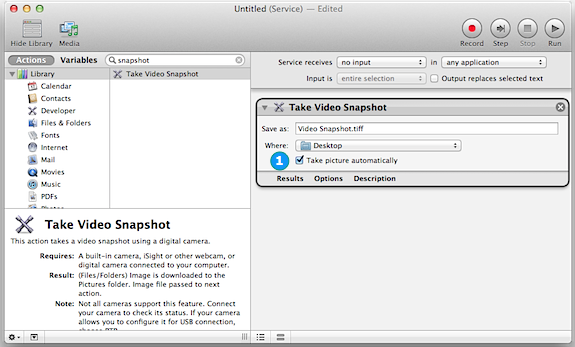 In the view for the Take Video Snapshot action, there is a checkbox, titled Take picture automatically, for indicating whether you want to require the user to click a button to take the photo snapshot. Select the checkbox (1) to have the workflow take the picture automatically. All you’ll need to do is smile. Notice that the two actions in the workflow (see above) are linked together (1), indicating that the results of the first action, the new photo file taken by the computer’s camera, will be passed to the second action as its input. This is generally how Automator workflows function, passing information and items between each step (action) in the workflow. Finally, as a bit of cleanup, we’ll indicate we want to delete the original image file taken by the camera, after it has been imported into iPhoto, by selecting the Delete Source Images… checkbox (2) in the action view (see above). 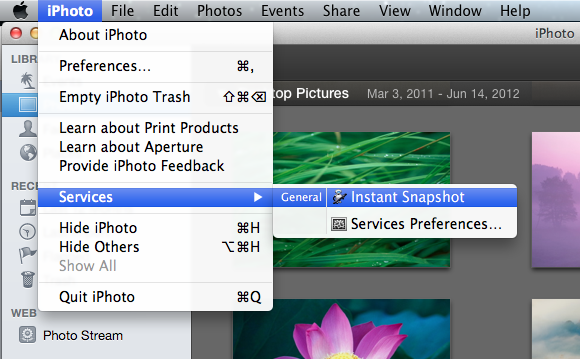 That’s all there is to creating a simple workflow for taking a camera snapshot and adding it to iPhoto! Now you’re ready to save and install the workflow. To save and install the service workflow, choose File > Save…. In the naming sheet, enter Instant Snapshot as the name for the service, and click the Save button. The new service workflow will automatically be installed as part of the System-wide Services architecture, and be available from any application’s Services menu. You can now close the workflow window. 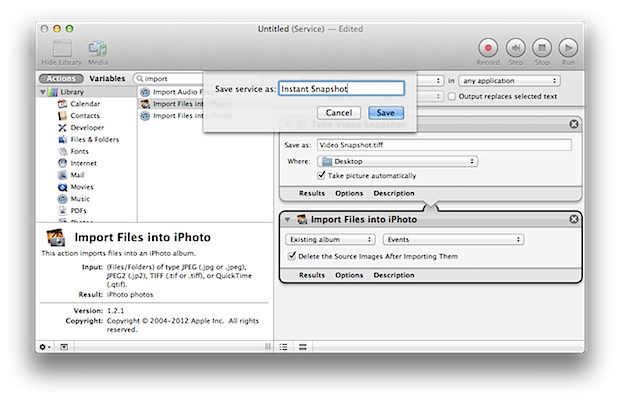 Using Automator, you have now created a useful tool for making it easy to take and add a snapshot of yourself to your iPhoto library. 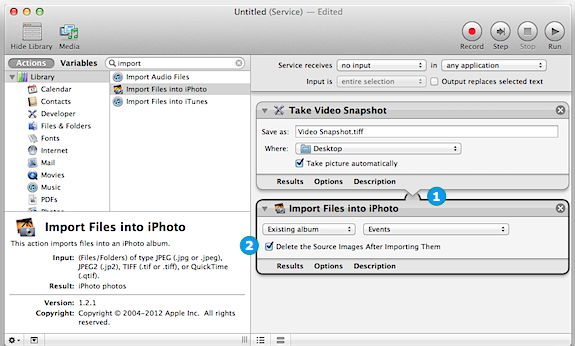 Tip: Want to learn more about Automator? Check out the built-in Automator Help on your Mac (in Automator, choose Automator Help from the Help menu).